In a move that’ll help Americans further their collective goal of being fat tubs of goo, Hostess is introducing pre-boxed deep fried Twinkies into the marketplace. In a twist that’s almost beautiful in its simplicity, the project is a collaboration with lowbrow mega-store Wal-Mart, where the product will be sold exclusively for one full year. According to the packaging, Deep Fried Twinkies are pretty much your traditional snack cake product dipped into funnel cake batter, as God no doubt intended. Though the cratered brown cream-bomb comes frozen, the brave souls that will endeavor to consume one of these deep-fried monstrosities are encouraged to eat them hot, with the package noting they’re “oven ready in minutes!” Powdered sugar, while not included in the box, is undoubtedly encouraged, as is anything else you can dip these things in, from hot fudge to marinara sauce to ranch dressing. It’s America, after all. We do what we want. 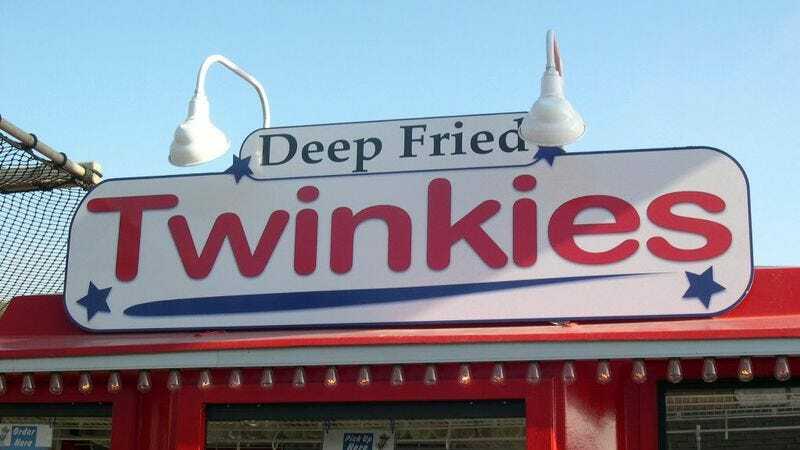 Deep Fried Twinkies will be available in Wal-Mart stores starting August 22, just in time for county fair season.